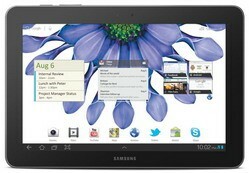 Samsung Galaxy Tab 10.1 Android Honeycomb tablet has been launched on Rogers and Telus in Canada. The shiny tablet costs $649.99 with no contract from Telus, while Rogers' Galaxy Tab 10.1 has a price tag of $679.99. Alternatively, it's also available for $349.99 on a three-year plan via Rogers. As you may well be aware already, Samsung Galaxy Tab 10.1 comes with a 10.1-inch 1280 x 800 touchscreen display, dual-core 1 GHz CPU, 1GB RAM, 16 GB storage, 3MP camera with LED flash, a 2MP front-facing camera for video chatting, 21 Mbps HSPA+, and Wi-Fi connectivity. For more information about the Samsung Galaxy Tab 10.1 you should head over to Rogers and Telus. 0 comments on "Samsung Galaxy Tab 10.1 for Rogers and Telus launched"